Coventry became the 21st university to go live on HEDD last week following Aston the week before. 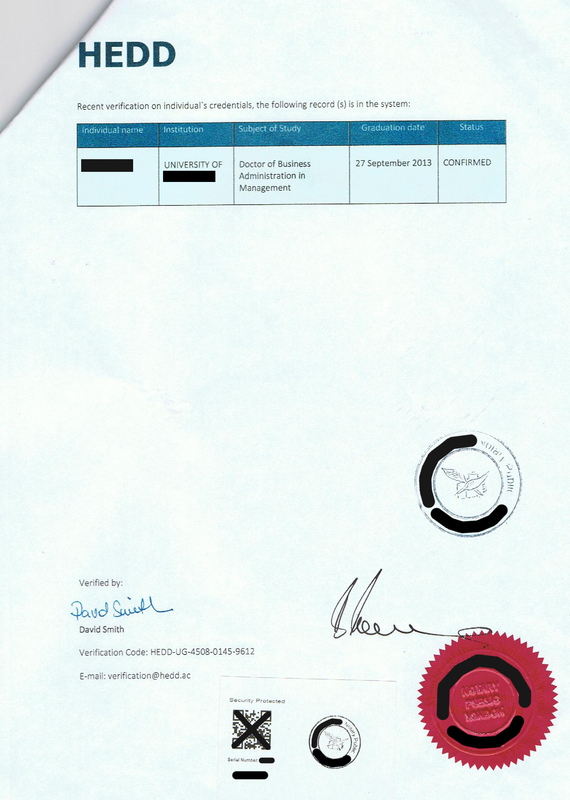 There is further evidence that HEDD is now well-established in the sector with the first fake HEDD certificate appearing. It’s an interesting twist. Rather than create a certificate with its complicated watermarks and holograms, just produce a verification check. What could go wrong? First of all, HEDD is a secure, online-only system – we don’t issue certificates. As soon as something is committed to paper it can be tampered with. It also appears to verify a candidate from a university that doesn’t use HEDD for its verifications yet. It refers to the HEDD website at www.HEDD.ac – our old friend the Ascension Islands domain, designed to mimic our .ac.uk academic sites and conveniently ‘undergoing maintenance’ if you try to go there. There’s not even the most rudimentary effort to reproduce the HEDD logo. More worrying is that the HEDD ‘certificate’ has been certified as genuine by a real Notary Public in London at a cost of around £80. We see a lot of scanned certificates countersigned by notaries attesting to having checked the original, but how can we be sure that they do it with any degree of rigour? A Google search would have taken them to the real HEDD website and exposed the truth in seconds. Our HEDDhelp team spoke to the Notary who hung up very quickly when we challenged him about signing a fraudulent certificate. We’ll be checking up on the owner of the Ascension Islands HEDD domain and reporting the Notary to his professional body. After reporting in November that most employers are still not checking qualifications despite high profile cases and our efforts to highlight the risks, it was good to see another fraudster put behind bars recently. Karen Carberry, Finance Director for Reed – the recruitment specialists follows Wade Jordan to prison. Reed paid the high cost of not checking her certificates when she joined them in 2001 and she rose up the ranks to Finance Director – syphoning off over £300,000 along the way. Ouch. Carberry denied but was convicted of obtaining a pecuniary advantage by deception between July 1, 2001 and July 31, 2001, fraud by abuse of position between 6 August 2009 and 9 July 2012 and two counts of using a false instrument between 13 August and 29 August 2012. The judge sentenced her to 4 years – but it could easily have been 6 if she had not had young children. That’s a lot of money to lose but how much greater was the reputational and brand damage to Reed? A lot of chatter and comments following the news coverage centred around Reed’s failure to vet their own staff and raised questions about the standards of vetting of candidates they place with clients. Their competitors were very quick to jump on this although, hand on heart, I’d be surprised if they could confidently say they checked every single employee. The BBC reported on new technology last week to offer secure digital badges for documents and certificates to verify their authenticity with the issuer. We are already looking into offering access to secure documents through HEDD. Meanwhile we are delighted to welcome Coventry and Aston to the growing number of universities in the HEDD service. With more universities due to join later this month this means nearly a quarter of UK graduates can be checked through HEDD. The BBC article talked of the burden of manual work to make checks and we know this is cited by many as a reason to trust CVs and certificates. We’re doing our bit to make it easier. Time for employers to step up.